I believe that you are on the correct track concerning the specimens. It is probably an inquiline and a parasitoid trying to reach the gall chamber. It looks like a unilocular (one-chambered) gall. 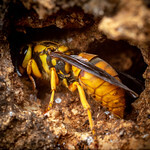 Often the inquiline female kills the gall wasp larva when ovipositing in the gall or alternatively the inquiline larva kills the gall wasp larva when it hatches from the egg and then goes on to feed on the plant cells lining the gall chamber. Some Eurytomidae have been found to have both zoophagous and phytophagous periods during its larval development, but often it oviposits in or on a host larva and in this case it would be the gall wasp larva as the inquiline just deposited its eggs. Species of one subfamily of Eurytomidae, the Rileyinae are egg predators, but I don´t know of any cynipid hosts and I suppose there has to be more than one egg available (in this case the inquiline egg) to qualify as an egg predator, so my guess is that the eurytomid is ovipositing on/in the gall wasp larva. So the larger cynipid wasp- a close relative of the insect that originally induced the gall- is usurping the gall for her own larva. 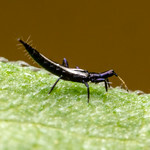 Meanwhile, the eurytomid wasp (probably Sycophila) is a parasitoid whose target isn’t the gall but the larva inside. Either way, it wasn’t a good day for the gall’s primary inhabitant. The easiest way to tell these two wasps apart is the antennae. Contrast the long, thin ones of the cynipid with the short, elbowed ones of the eurytomid. These wasps belong to rather different branches of the Hymenoptera phylogeny. Thanks to all who played. I’ll do an easier one next week. This one was a real puzzle and a learning experience. I’ll take a point for mentioning chacidoids, and another for identifying the oak. What? No points for me? I am crestfallen! I’ll give you ten each, James, since no one picked the chalcidoid or was as specific about the oak. The kicker was the fact that the inquiline is – like the gall maker – a cynipid also, which made it easy to assume it was the gall maker. I also missed the fact that not one, but both wasps are ovipositing, making the scenario of one being an emerging adult unteneable. I probably should have given the oviposition hint earlier. Anyway, I’ll give you TWO points for your suggestion. Though I had absolutely no idea what was going on, I find the explanation interesting. Thanks, Alex. Yes- I’ll give you ten points for that. Don’t spend them all at once, though.